On August 8, 1945, of all the 273 planes that departed Tinian for the attack on Yawata City, only the B-29 Nip Clipper was downed. The Co-pilot was Second Lieutenant Carlton Holden, twenty years old, and he had already completed sixteen bombing missions. The Nip Clipper had a crew of eleven members, and the target for the day was the industrial city of Yawata. Along with the other B-29s, they flew a long distance to reach Yawata. While releasing its bombs, the Nip Clipper took a hit to one of its wings, near the third engine. The wing caught fire. They decided to fly towards Okinawa, praying to reach there safely. However, in spite of the efforts made by the crew, it dropped down emitting smoke. 2nd Lt. Holden decided to parachute down first. He bumped his head on the hatch and was knocked unconscious, but came to before he landed in the sea. Other members of the crew followed. The captain, George Keller, also parachuted down to the sea; however, his plane was in a vertical spin, fell on him, exploded, and he was killed. The ten surviving members floated on the sea for seven days. They rode separately in eight lifeboats, and the only food was just a cake (hard candy) named ‘Charm’ for each one, which they ate half at a time. For the the duration, they survived on just a small amount of water. On August 15, they were saved by fishing boats along the coast, and were held by the Military Police Headquarters of Hamada. The bombardier, Second Lieutenant Walter Ross remembers the awful anger of the Japanese people, it being right after the announcement of Japan’s surrender, which was made by the Emperor of Japan. A guillotine and baskets had been set up, and it seemed certain they would be beheaded the next day. The man who saved them was Mr. Nobuiti Fukui of the Military Police. (He was nicknamed the “The Tank”, so he might have been a stout man.) He was fluent in English. On hearing that fishermen were capturing American soldiers, he hurried to the scene of the arrest. Just in time, he saved them and put them onto the train and took them to Hiroshima. They arrived in Hiroshima on August 17. Second Lt. Fukui of the Military Police said, “Let me show you what the US Forces have done,” and on the way to Ujina Military Police Headquarters, he stopped the truck in front of the Red Cross Hospital, and made them view the wreckage of the city and streets. They were the first Americans who visited Hiroshima after the atomic bombing. Fukui went on, “Look hard what had been done with only one bomb, only one…” There was nothing moving on the streets, no dogs, nor cats. No one was seen walking in the streets. Holden recalls, “What I saw was just two barber chairs sitting in the middle of the town. Every part of town was just wreckage.” According to the above mentioned article and other weekly magazines and so on, the POWs then were taken to Hiroshima Station, and Neal and Brissette were put onto the rear part of the truck. However, that was not factual. The two already were in Ujina by then. The US POWs were taken to the Military Police Branch Headquarters of Ujina, and it seems that they met Neal and Brissette there. The description of the two is a vivid recollection. They were both suffering from terrible nausea and pain. From the edge of their lips was oozing some green sticky liquid, which was flowing out of the ears as well. Towards night, their conditions became worse. When their consciousness returned they complained of the pain. So, the crew members gave them shots of morphine, which was in the emergency kit they had received from the Japanese. Although it is written so, some believe the morphine must have been what the US flyers had carried. In reality, there is only a small chance that the Japanese in those days had morphine. Neal and Brissette both asked the B-29 crew to visit and tell their parents about them. The crewmen promised they would do that by all means. One of the crew said to a Japanese medical doctor, “Can’t you do something to help them?” The doctor replied, “Do something to help? This is what you have done. How should/could I know what to do?” He also asked if there were other American soldiers. The doctor said although he did not know for certain, it seemed there had been some POWs held in Hiroshima. They might have been dead by then. Neal and Brissette told them that after the flash of the A-Bombing, the building where they had been interned was wrecked by the bomb blast, and people ran out of the building and went towards the streets. Some of them were badly burned, and some had thrown themselves into puddles. It is said that Neal and Brissette had been found in a Japanese traditional human waste pool for agriculture (a cesspool). There was no such facility at the Military Police Headquarters. It is likely to have been the moat surrounding the Hiroshima Castle. The graves of Ralph J. Neal (left, the shorter one) and Normand Roland Brissette (right, the taller one), which had been located in Ujina, Minami-Ward, Hiroshima City. On the wooden markers is written “Grave of a US Soldier”. The two bodies of the flyers, who died on August 19, had been cremated by the order of Captain Taro Takahashi, the Commander of Ujina Dispatched Military Police. Around 2:00 a.m., the morphine ran out, and the two victims pleaded with the soldiers to shoot them in their agony. However, the crew members’ pistols had all been taken away from them. Neal died at 2:00 a.m., and Brissette died at 2:00 p.m. Several Japanese came and carried away the bodies to an unknown location. The dying requests of the two, “Please tell my parents about me”, was conveyed by 2nd Lt. Carlton M. Holden, co-pilot of the B-29, to the mother of Brissette. The same must have been done for the family of Neal, although the author has not been able to confirm that. I came into contact with the bereaved family of Normand Brissette through a totally different route. In the fall of 1998, an overseas envelop reached my mail box suddenly. The sender was Mr. Paul Brehm, and it had been posted in California, USA. I have never heard of the name. Who wrote to me and for what purpose? As I opened the envelop wondering what it could be, there were a letter and a postcard in it. First, I looked at the postcard. It was a picture of a strange-looking vessel, the front part of which was a battleship, while the latter half was a carrier vessel. According to what I learned later, it was a picture of the Hyuga, a Japanese Naval battleship that was sunk by the U.S. bombardment off Kure. What was painted was the instant when a diver-bomber SB2C Hell Diver was diving towards the Hyuga as if it was going to hit the ship, and was dropping the bomb it had carried. Then I read the letter, the content of which was as follows…On July 28, 1945, two colleagues of Mr. Brehm, 2nd Lt. Raymond Porter and a bombardier, Norman (sic) Roland Brissette, who had been attacking the heavy cruiser Tone, were hit by anti-aircraft fire, and their plane was shot down. They parachuted down, and while they were floating on the Seto Inland Sea, they were discovered and saved by the Japanese. Then they were taken to Hiroshima where they were killed by the atomic bomb. On reading the letter, I could not subdue the quickening beat of my heart. Mr. Paul Brehm was aboard the Ticonderoga, as was Brissette, and during the attack of the Tone he was flying right behind 2nd Lt. Porter’s plane. The plane flown by Porter and Brissette was hit in front of Brehm by the anti-aircraft fire of the Japanese, and it went down emitting white smoke. Mr. Paul Brehm was a pilot and his rank was Second Lieutenant. He knew my name through a historian David Rogers, a former Army Captain, who is the a historian of the Army units. In fact, it is quite difficult to find families, especially the bereaved families, of former US Navy personnel. Until then, I had searched through various routes using the family name Brissette, but had no success at all. Mr. Brehm’s letter reached me as a complete coincidence. I immediately jumped on the chance and looked to Mr. Brehm for information, which turned out to be the right thing to do. Being former Navy personnel, he knew where to look. It was the U.S. Navy Museum in Pensacola, Florida. The museum had a vast amount of personal materials related to Navy personnel. I decided to ask Mr, Hill Goodspeed, a staff member of the Museum, to search through the materials. Finally, Mr. Goodspeed found the bereaved family of Brissette. It was his younger sister, Ms. Constance Probencher. When you exchange with bereaved families, you will realize there is a difference between the blood relatives and in-laws in the ways they respond to the sad news. No matter how much time might have passed since the tragedy, the news cuts the blood relatives like a knife, while the in-laws generally accepted calmly the death by the atomic bomb. Being one of the former, the sister’s grief was poignant. In the Diplomatic Archives of Japan are preserved the instructions the GHQ issued about the remains of the Allied Forces. They are dated November 19, 1945, and come in both English and draft version of translations. According to this document, quite a number of the people from the Allied countries passed away during the war in Japan. Their bodies were cremated and buried in Japan. The information about those cases were presumed to be kept at the local police and with ordinary civilians. Therefore, the GHQ ordered the Imperial Japanese Government to call to relevant local organizations all over Japan about the information of whereabouts of the remains and submit the complete record to the GHQ. The information they wanted was the name and rank of the person who died, the date, place and cause of the death, where the remains are, and the name and address of the person who knows where the remains are. Through the notification, information started to be gathered about those who had died and were buried in Japan. In July of 2007, it was reported in the media that the death certificates of Brissette and Neal are preserved in the National Library of Japan. They were found by Mr. Toru Fukubayashi, a researcher from Kyoto, about which Mr. Fukubayashi had referred to me as well. Certainly, these were the real certificates of deaths. They were hand-written in a military letter pad of the Japanese, with the signature and seal of the medical doctor. The names written in them were, respectively, Ralph J. Neal and Norman(d) Roland Brissette. The date for the onset of their illness was both August 6, 1945. The names of the disease were as follows: Neal, “explosive injuries on the neck and face”; Brissette, “Explosive injuries on the abdomen and the soles of both feet”. The place of death was written as “Hospital affiliated to the Training Center of Army Vessels”. It was a facility of the Japanese Army in Kure. It was a hospital around 4 km from the epicenter. In the Japanese version of the record, which was attached to one in English, had the same content, but it was written as [normand] for Normand. Neal and Brissette, who were alive for thirteen days after the atomic bombing, passed away one after another at the Hospital affiliated with the Training Center of Army Vessels on August 19. According to the order given by Taro Takahashi, Commander of the Ujina Branch of Chugoku Military Police, their bodies had been cremated, and grave markers had been erected. The one to the left is Brissette’s, while Neal’s marker stands on the right. The names of the two were written in Indian ink. Former Commander Takahashi lived in Hakone until the age of ninety-two, and he told me that the two American soldiers were feeble, so he gave them some whisky and chocolate. In those days right after the atomic bombing, the victims had seldom been buried in an individual grave. These are actually rare cases when both death certificates and graves were arranged for victims. What could be presumed through those facts is that the U.S. side must have grasped quite an amount of detailed information about the POWs, especially those who died. The existence of the death certificates shows clearly that they grasped detailed facts about the deaths of the U.S. POWs by the atomic bomb. Instead of that, the facts had been hidden from the Americans and the rest of the world in the darkness of history until long after the war.. It was hidden by the country that dropped the nuclear weapons. Although some small amount of information has been released, for the most part, the U.S. Government still pretends ignorance about the manipulation and concealment. In 2004, I received an envelope from an American. The sender was Mr. Nathan Long. The name rang a bell in my memory. The mailing address was in Tokyo. He was a grandson of the elder brother of late John Allan Long, who had died from the A-Bombing, and the elder son of Mr. Robert Long, the nephew of Corporal Long, who I had already contacted. I knew the name of Mr. Robert Long in Vol. 1 of the Hiroshima A-Bombing War Damage Records. There, it is written that Reverend Robert Long, a nephew of Corporal Long, submitted the name John Long to Hiroshima Local Government as a U.S. soldier who died from the atomic bombing. It was also written that Reverend Long was in Kobe. Therefore, I looked for him all through Kobe City, but I could not find him. It was after the Great Hanshin Earthquake, and I almost gave up searching for him. However, someone who was related to Christian churches incidentally told me that Rev. Long was stationed in a church in New York City. I immediately wrote to him. He responded. It was three years later that this Mr. Nathan Long sent me this letter. He wrote as follows: My father told me that Mr. Mori had made a detailed research about the Lonesome Lady. I would like to meet and talk to you and receive some advice from you. Nathan wanted to know the facts and situations about the Lonesome Lady in more detail beyond what had already been publicized by then. Therefore, I wrote telling him I would be glad to guide him to the place where Cpl. Long had been held and the place where he died. We met on December 30, 2003. It was a day filled with busy atmosphere of the end of the year. Nathan came with his wife. Mrs. Lura Long, wife of Cpl. John Long, and Nathan Long, whose father was the elder brother of Cpl. John Long.. Photo courtesy of Nathan Long. I first took them to the site of Chugoku Military Police Headquarters. A memorial is built there. It is the only one which was built to honor American victims among more than 300 memorials in Hiroshima. In fact, it was a memorial I dedicated by saving up the income from my side job. Nathan looked up at the memorial, looking at Corp. Long who had been enshrined in there. After he read the epitaph engraved on it, he and his wife stood in deep prayer, thinking of the great grand-uncle. Next, we went to the site of Chugoku Area Army Headquarters around 1 km away. It is a vacant lot now in front of the Hiroshima Castle. According to the Hiroshima A-Bombing War Damage Records Corp. Long was killed by the A-Bombing here. The couple read the explanation in English about the site, and were standing for some time in silence. As it was towards evening, I invited them into a coffee shop. Now it was my turn to ask them questions. I asked him how much he knew about Corp. Long, who was the brother of his grandfather. He spread a file of materials he had carried. There were two sheets of photocopies. One was a GHQ material in which is typed eighteen names of American soldiers, who were killed by the atomic bombing. Another was an article about Rev. Robert Long, Nathan’s father, that he had made inquiries to various organizations of the U.S. Forces about Cpl. Long, his uncle. However, he was unable to learn anything. The paper was dated thirty-three years ago. Nathan’s father had tried his best to learn some precise information about his uncle; however, he never succeeded. I realized that the bereaved families of the U.S. soldiers who had been killed by the atomic bomb had never been told anything by the U.S. Government. Of course, I have heard through articles and so on that families are not informed. However, when the facts are presented in such a form in front of my eyes, I have not been able to stop some indescribable emotion rising in my heart. I had, in fact, heard from Robert, Nathan’s father, that the wife of Corp. Long, Lura was still living. They were married after they had been in love for six years. However, he was sent to war six months later, and never returned. Lura Long never accepted the death of her husband. She firmly believed he would come home, so for some time she did not hold a funeral service for him. She worked at a department store until she was eighty years old, and she never met any relatives of the Long family. However, in July two years ago, when the nephews contacted her telling their wish to meet her, she accepted. Sixty years after the end of the war, she might have been released from the curse of war. Long, very long days had passed. Can we call it peace? When I heard the story, I could not stop crying. Since the encounter with Nathan, I came to know more bereaved families of the U.S. soldiers. It happened around the same time of my encounter with Nathan and his wife that I had finally found a bereaved family of a crew member of the Lonesome Lady, who had been killed by the atomic bomb. I was waiting for the arrival of the documents from a family in order to register his name in the newly completed Peace Memorial Museum. A photograph of the victim and a set of completed documents are now necessary for the registration to the new Peace Memorial Museum. The original Memorial had contained in it just a roster of those who died, without any photos of them. The new museum was opened in August 2002. Therefore, I called the bereaved families in the U.S. to register the photos of their loved ones. However, no replies arrived even in 2004. I made up my mind to call the four families again, whose loved ones had already been registered by myself in the roster of deceased held in the Memorial. Just then, the news of Corp. Long was distributed by AP and articles were posted in American newspapers. It also included a notice that the Peace Memorial Museum of Hiroshima was calling for the registration of the photos of the victims. Mr. Francis Ryan, the elder brother of 2nd Lt. James Ryan, who was a crew member of the Lonesome Lady and was killed by the atomic bomb, read the article in the Atlanta Journal of his local area. He immediately asked me for the registration of the photo of his brother. Francis was a former Marine, and he had met his brother in Saipan. The Ryans had three sons, and all of them had volunteered to military service during the Pacific War. However, it was just the eldest, Francis, who survived the war. James Ryan had a sweetheart, with whom he had become engaged to be married. She married another man after she heard the report that Ryan had been killed in action. However, she does not forget James, and after her husband passed away, she and Francis have been good friends. For the registration of the atomic bomb victims at the Peace Memorial Museum, the regulation requires that direct kin submit the papers. Therefore, I sent the document to Francis, which he filled in and sent back to me. Along with that, Francis also sent some materials to me. They were the copies of letters and telegrams exchanged between the U.S. military and the Ryan Family after the Lonesome Lady did not return. They reveal the situation of the families and military authorities during the war. On August 12, 1945, for the first time, the Ryans received a shocking telegram. The sender was Brigadier General Edward Wissell, and it reads as follows: Your son James Ryan has been missing over the sky of Japan, since July 28, 1945. Then on August 14, an envelope arrived notifying that it was confirmed that their son was missing over the sky of Japan. However, the details were unknown. On August 31, they received a telegram. Cap. Cartwright and Sgt. Able safely arrived home; however, regrettably we have no information about the other members of the crew. In December of this year, a letter came: your son still is missing. The investigation is on-going; however, it has been difficult for us to grasp the current situation. As soon as some new information has been available, it will be forwarded to the family. The telegram that arrived on February 18 the next year crushed the hope that the mother of the family had held. “Your son, 2nd. Lt. James Ryan was killed in action on August 6, while he was interned as a Prisoner of War. It was a brief statement. 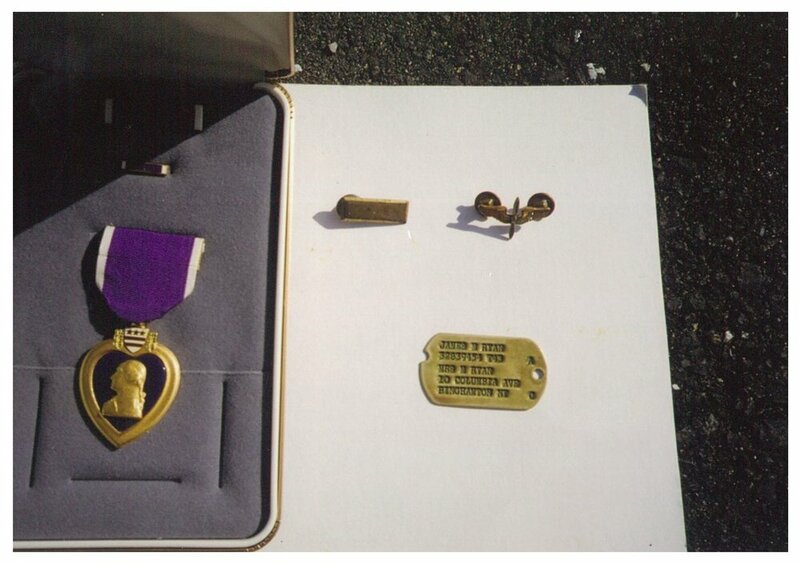 Following that, on March 7, the Government notified them that the Purple Heart Medal has been awarded to their son. It was explained that the medal had been awarded as the state would like to express appreciation for the bravery and sacrifice of 2nd Lt. James Ryan. However, it gave no consolation for the family. On May 21, a letter of condolence from the Supreme Commander of the Army, General McArthur was delivered to the family. Among the families of the US soldiers who had died from the atomic bombing, just the Ryans received the letter of condolence from General McArthur. The reason is still unknown. The letter, of course, showed the customary words of condolence, so it could be sent to anybody simply by changing the name. Following this, the letters of condolence by other military personnel arrived in June and July as well. About the remains, they were told that it was difficult to identify them individually; therefore, they were put together and were on the way to the USA. By a later letter, they were reported that the remains were buried in a National Cemetery. It was October 29, 1946. No details were ever provided about the circumstances in which their son was killed in action. Because it was in a newspaper article, it was not difficult for me to learn the address of Shallon (Sharon?) Olson, the daughter of Sgt. Atkinson, a crew member of the Lonesome Lady, who is considered to have died on Aioi-bashi Bridge. I hear she was three years old at the time of death of her father. I had a sense of guilt towards her: I had promised her I would send back to her the remains and the personal belongings of Sgt. Atkinson; however, I could not obtain any of them, therefore, the promise was never kept. I extended my apology to her; however, she must have felt Japanese people could never be trusted, and she seemed quite angry with me. The registration at the Memorial Museum did not happen, and it took quite a long time before she opened her heart to me. I would like to write about the registration of 2nd Lt. Looper, a crew member of the Lonesome Lady. Usually the photo sent by the family presents just him in it. However, what his wife sent me, quite some time later, showed the couple with their daughter. I could not help thinking of a peaceful time that the Loopers had certainly enjoyed once. I am now going to write about two survivors. Mr. Cartwright, the Pilot and Aircraft Commander of the Lonesome Lady, went to a university after he was discharged from the Army. He then attended graduate school, obtained a Ph.D. in Agricultural Science and worked as a professor. As a POW, he made up his mind to work in agriculture, if he survived the war. He chose to study genetics because he wanted to be of help for those who were engaged in agriculture. He contributed much in Texas to the improvement of cattle. There was another survivor, Mr. Able. Unfortunately he was suffering from cancer, and I could rarely communicate with him. However, just once through Dr. Cartwright, I received a letter from Mr. Abel. According to that, he was sent from Tokuyama to Kure, and had been held in the Naval Prison of Kure. It seems he was treated with kindness. He told me he would like to know the name and address of the commandant. If the commandant had still been around, he must have been more than one hundred years old. I had no means to look for the information. Therefore, I had to write to him. Later Dr. Cartwright sent me a letter forwarding the sad news to let me know Mr. Abel’s passing. Including the survivors, every one of the U.S. victims of the atomic bombing was young. Their age was in a range of nineteen to thirty. Only Long was a conscripted soldier, and the others all volunteered to military service. They fought against Japan, and died in a foreign country away from home. Since then, more than sixty years later, the war had left such big scars on both Americans and Japanese. In the USA, there are two memorials honoring these U.S. soldiers who died. One is a tombstone constructed by the U.S. military in a National Cemetery in St. Louis in the State of Missouri. Another is a memorial tablet, a shield made of copper, at the Civil War Memorial and Prisoners of War Museum in Andersonville, Georgia. This one is not made by the U.S. Forces or Government, but was funded by an anonymous benefactor. Presidents James Carter and Ronald Reagan, Senator Sam Nunn, the Secretary of Defense Colin Powell, and others sent statements that were read at the dedication ceremony on August 5, 1989. The gravestone of the US flyers who were killed by the A-Bomb, which is in the National Cemetery in St. Louis, Missouri. The date written for Molnar is July 28; it seems that the date the B-24 Taloa was shot down mistakenly reports the date of his death. "In honor and memory of the flyers of the US Army Air Force and U.S. Navy airmen who lost their lives while prisoners of war at Hiroshima, Japan, the day of the bomb – August 6, 1945." The response to a US Freedom of Information Act request filed by Barton Bernstein states a 5 August, 1989, quote from (former) President Ronald Reagan “May the memory of their heroism never be lost”. In his book “Courage Beyond the Blindfold: The Last POWs of World War II”, Walter Ross wrote that he and other survivors of the B-29 Nip Clipper saw Ralph Neal and Normand Brissette on 17 August when they were brought together in Hiroshima near a train station. Ross describes loading Neal and Brissette into a truck with Fukui for the trip from Hiroshima to Ujina. The original publication of this book in Japanese, the book in English by Tom Cartwright, and other sources have informed the Neal family of their findings about Ralph Neal. Editor’s note [MS]: Bill Abel and Tom Cartwright met more than once to discuss their experiences as POWs. Abel’s treatment was not always kind; he was brutally beaten and had endured kidney damage from being kicked while imprisoned. At the end of the war, Abel was released from Ofuna camp, not far from Yokohama. The date of death engraved on the tombstone appears to be mistakenly corrected with a newer engraving that appears to change the date from 5 Aug to 28 July. On October 18, 1999, Mr. Cartwright, the former pilot in command of the Lonesome Lady visited Hiroshima. His wife, Mrs. Carolyn Hobson Cartwright, and their son---a Medical Doctor, and also Mr. J. M. “Matt” Crawford, the President of the 494th Bombardment Group of the 7th Army Air corps veterans Association, came over with him.